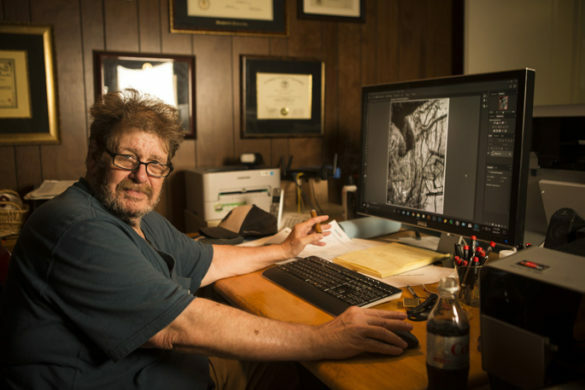 Nashville photographer Fred Dusel took a long draw on his ever-present trademark cigar as he studied a richly detailed carbon transfer print of wind-twisted driftwood on a barrier island beach in Georgia. 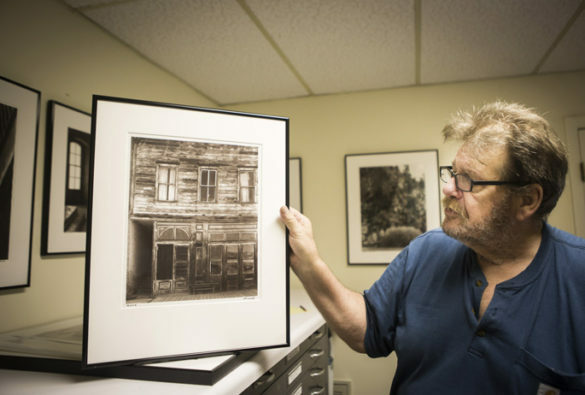 At the time, Dusel was considering the print for a month-long exhibit of his photos in downtown Sacramento, California, which opened in September, an undertaking he never could have accomplished without receiving specialized care from Sara Martin, M.D., medical director of Outpatient Palliative Care at Vanderbilt Health. In 2015, Dusel was diagnosed with lung cancer, which he calls “unsurprising” due to living “a dangerous life.” Though he hasn’t touched alcohol for decades, he began smoking and drinking at a young age. He worked in lumber mills until joining the Army at age 17. During six years of duty, Dusel went through Airborne School, Ranger School and Special Forces training, and he served more than 30 months in Vietnam. While there, he had significant exposure to the pesticide Malathion and the herbicide Agent Orange. Dusel had completed radiation therapy and chemotherapy at Vanderbilt-Ingram Cancer Center when he began experiencing unusual mood swings. An MRI revealed his cancer had metastasized to an area of the brain that regulates emotion. After surgery to remove a brain tumor, he received more radiation. Then, things began to snowball for Dusel. He had vision loss, trouble with balance and began sleeping his days away, waking only to experience debilitating bouts of anxiety and depression. That’s when Martin’s expertise in palliative care — medical care focused on pain and symptom management as well as psychosocial interventions — changed the path of his disease. Dusel’s journey is the subject of a new documentary, “A Modicum of Joy,” premiering during an invitation-only event at The Belcourt Theatre on Oct. 2. The film, a collaboration between Palliative Care, radiation oncologist Mark Stavas, M.D., and an independent film crew, came about because Martin realized patients, patient families and even other medical providers often don’t understand what palliative care is and how it can benefit an individual’s quality of life as they cope with life-threatening illness. During the film, Martin conducts a palliative care consultation with Dusel to learn who he is, how his disease is affecting his life and what goals she might help him achieve. Dusel isn’t hesitant in giving Martin credit for improving his life now, through better symptom and pain management, management of his depression and anxiety, and a reduction in the amount of post-radiation steroids he had been taking. The documentary concludes with Dusel re-visiting Ossabaw Island, a barrier island south of Savannah, Georgia, where he first experienced symptoms of his brain tumor. Ossabaw is a protected Heritage Preserve, and Dusel had received special permission to set foot on the island. 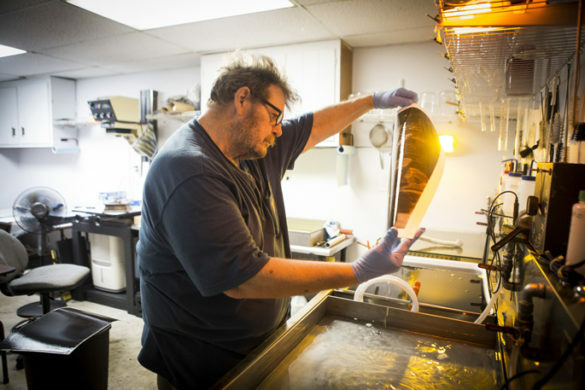 In addition to taking and printing his own photos, he leads workshops to teach others the art of carbon transfer printing. The process takes several labor-intensive darkroom hours to produce a single dimensioned image. At Vanderbilt, Stavas hopes to create a series of documentaries featuring recognized personalities as they progress through cancer treatment and discover new ways to achieve quality of life. His first documentary, “Intentional Healing,” premiered at the Nashville Film Festival in April 2017, and featured the story of famed Nashville music producer Jesse Boyce. Stavas is hopeful that the premiere of “A Modicum of Joy,” which will be shown to an audience of Vanderbilt Health and community leaders, as well as patients and families affected by serious illness, will spread the word about his mission.